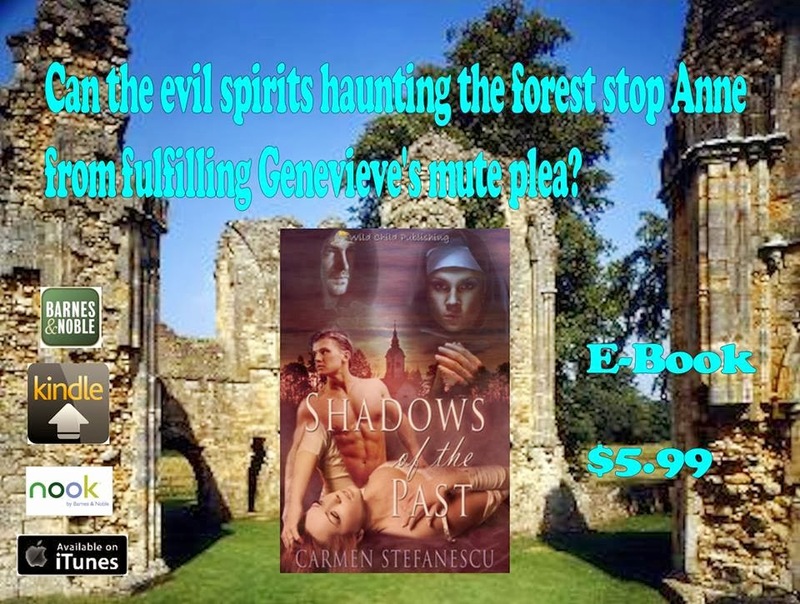 Shadows of the Past by Carmen Stefanescu brings together two very different lives of two women. Both are our heroines - one from the 15th Century and one from our modern day. Their lives are intermingled around tragedy, boundless love and the power of good magic. The story tells the tale of a young nun's difficult life and the contentment she finds living under the protection of a convent. Genevieve decided to join the convent because there were so little choices for young women on their own. Her life there was blissful to begin with but things don't go well when the kind hearted Abbess who has sheltered and nurtured Genevieve is replaced by a wicked, soulless creature whose jealousy and persecution of the young nun is relentless. Things are further antagonized when the beautiful Genevieve falls in love with a man who the evil Abbess has intentions of seducing herself. The man is himself a man of God and this adds to the drama of the tale. Anne is our modern hero. She's a successful business woman who is trying to repair a damaged relationship. She heads her family's business and is intelligent and articulate. Although worlds apart, the lives of the two women are intrinsically woven together in this charming book. Meanwhile, Anne is trying to reconnect with a past lover on a hiking holiday. Unbeknown to her she finds herself in the same mysterious forest that has haunted Genevieve. Ghosts and spirits haunt her sleep and visions worry her waking hours. They are her 'Shadows of the Past'. Ms Stefanescu is able to bring her readers two different stories and lace them together to produce an intriguing and interesting tale. I was able to appreciate the both worlds represented here and I easy became entranced with the suspense and mystery evoked in this absorbing tale. I am giving this five stars and I am looking forward to reading more from Carmen Stefanescu. Thank you for passing by and comment!